Welcome back. 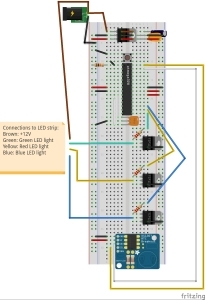 After designing the circuit using adafruit's lovely tutorials, the next step is to build it. I have attached a photo of what the circuit looks like in real life. A few points about why I chose to do certain things. Red: I always use red wire for 5 Volt power. If it's red, I know that it's a 5V signal. Brown: Brown wire is my 12 Volt power coming from my 12 Volt power supply. Black: I normally use black wire for ground. In this case, I am not using negative voltage, so all black wires are ground. White: I usually use white wire to transmit signals from the arduino and for my resonator. Yellow/Green/Blue: This is a generic color for transmitting signals. Normally, as long as two adjacent signal wires are different colors, then it's ok. Normally, I use wires in (sort of) the following order: White/Yellow/Green/Blue. 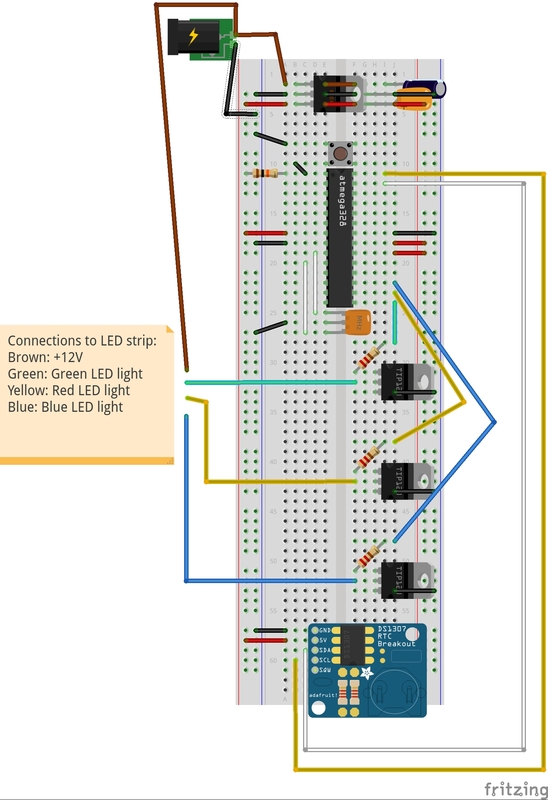 For this project, I chose green, yellow and blue to transmit the signals to my TIP120's so that I know what wires are going out to control each part of the RGB LED's. I can't use red as a signal wire, because I only use red for 5 Volt power. Note: I didn't show the input power and the wires going to the RGB LED's in the picture below. There are, however, wires sticking up where I will put the RGB wires. The input power is unmarked, but has a brown wire on it already to remind me where it goes. 2. Resistors: I used 10 kOhm (10,000 Ohm) resistors for my button, and 1 kOhm (1,000 Ohm) resistors for my TIP120's. I do not need very much current for buttons, and the TIP120's do not need very much current to turn them on. 3. 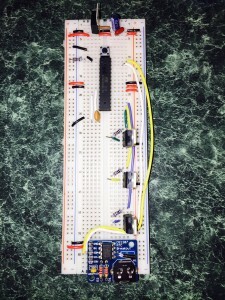 Capacitors: I used two capacitors for my voltage regulator. This helps to smooth out voltage spikes, which will occur as I turn the LED's off and on quickly. I used the capacitors that I had sitting around. Normally, I use the circuit described in Make: Electronics by O'Reilly. That has a 0.33 microFarad electrolytic capacitor on the input voltage and a 0.1 microFarad ceramic capacitor. If you are interested in learning about the basics of hardware, that is a great book to pick up. The capacitors I had were a little bigger, but it should work fine.